The state of the art Spa.Wave table combines the gentle sound waves of specially designed music with a highly efficient vibration massage system. While the special sounds slow down the mental activity, the vibration massage acts specifically on the energy centers of the body. 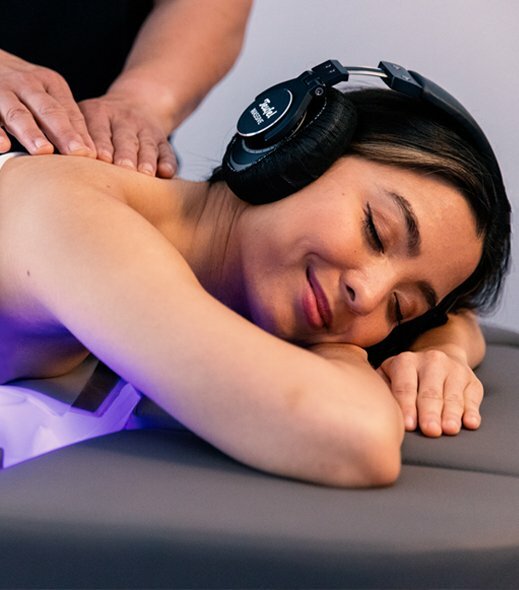 This innovative sound massage system combines the effects of deep relaxation techniques as well as meditation and mindfulness. Spa.Wave offers an extraordinary relaxation and anti-stress experience. Limited availability. Please call for reservations. 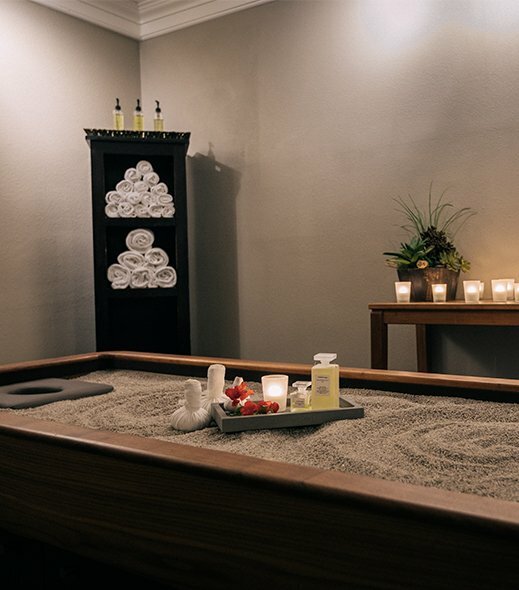 This treatment uses the deep, dry heat of quartz sand to alleviate muscle and joint pain. The warm sand is embedded in the special treatment table to ergonomically support the body so that it surrenders into a state of deep relaxation. The cocooning experience has a profoundly calming effect on our psyche and soul. Warm oil pours in a continuous stream over the forehead stimulating the third eye chakra. The gentle pressure and soothing warmth of the oil allow the body, mind, and nervous system to experience a deep state of rest, similar to meditation. This unique body treatment induces a relaxed and blissful state of consciousness and is completed with an Indian head massage. This full body Swedish massage is an excellent way to recover from daily stress. Long, relaxing movements increase circulation and effectively ease tired muscles. 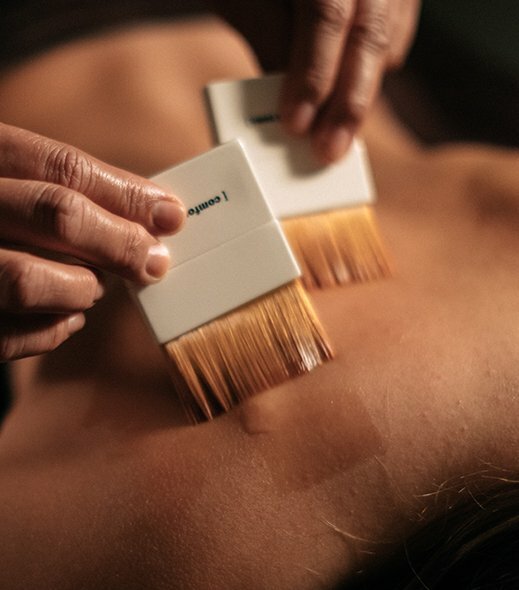 This premier body ritual highlights aromatherapy, a full body massage and exfoliation. Enhanced with pure volcanic ash from the Stromboli volcano in Sicily and rituals from ancient cultures, this treatment will leave you relaxed and renewed. This unique experience uses the refined qualities of the senses. Aromatherapy, meditative sound and the gentle touch of delicate brushes favors sleep, aids in relieving chronic stress and is ideal for jet lag recovery. Heated stones and therapeutic essential oils relieve muscle pain and increase metabolism while melting away stress. Please note: This treatment is weather dependent. We do not perform this treatment if the temperature reaches 100 degrees. 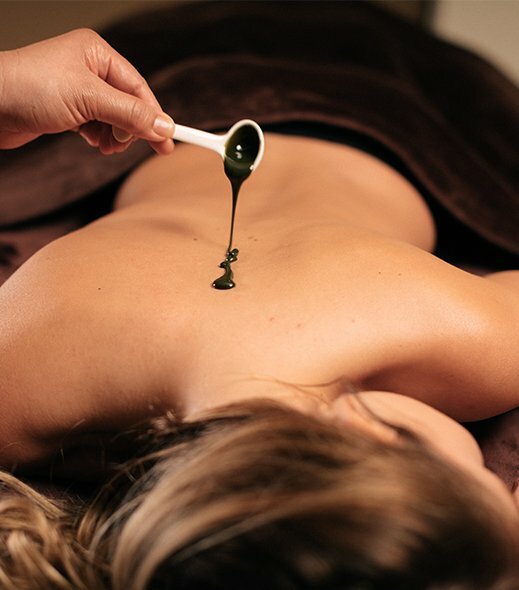 Using an innovative mud from the Bagni Di Pisa in Tuscany, this massage features an application of mud to the back, an excellent way to recover from stress and tension. This three-in-one experience is an excellent remedy for the whole body. Exfoliate, re-oxygenate and restore moisture balance to the skin. At a time when you need to receive as much care as you are giving, this massage will nourish your body and nurture you soul. Special techniques and oils improve circulation and reduce swelling in the legs and ankles. Please note that guests should be at least 14 weeks pregnant to receive a massage service. If you’re less than 14 weeks pregnant, we have a very limited number of providers who can perform your massage. Please let us know with as much advanced notice as possible for the best availability. For inflammation, joint and muscle pain, this Hemp plant extract aids in reduction of stress, anxiety and pain. Contains zero THC. CBD massage oil and Hemp pain relief cream replace traditional massage oil in this service. Enhance any massage or body treatment with our signature foot and lower leg enhancement for tired, achy legs and feet. Two people, two therapists, two tables, one room! Relax and indulge with a friend or someone special. Rooms are limited. Please inquire for availability. Restrictions may apply. To reserve this special experience please call 888-Glen-Ivy (888-453-6489) at least 3-weeks prior to your visit and we will be happy to assist you. Our Oncology Certified Therapists have been extensively trained on clinically established guidelines to offer safe and effective techniques for the changing needs of a past or present oncology patient. Enjoy a massage or facial customized to suit your needs. Restrictions may apply. To reserve this highly specialized service, please call 888-Glen-Ivy (888-453-6489) at least 3-weeks prior to your visit and we will be happy to assist you. Please note: Our spa services are reserved especially for you, so we ask that you let us know by 4pm on the day before your appointment if you need to reschedule or cancel. For additional information, please refer to our FAQs.